Join us in person at the Center For Open Science or follow the event via Livestream. 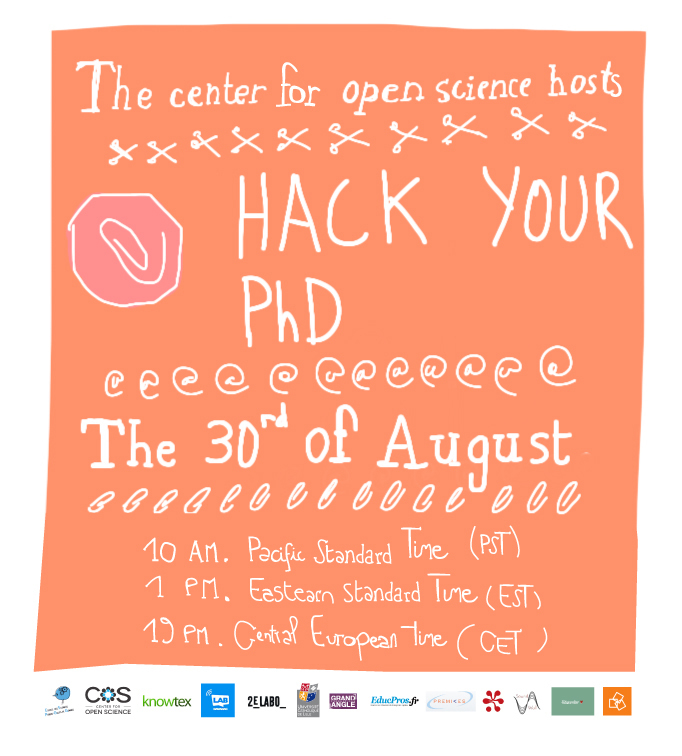 Célya Gruson-Daniel @celyagd, Co-Founder of HackYourPhD @HackYourPhD will open with a short presentation of HackYourPhD. Célya is based in Paris and has been touring the United States this summer producing a web documentary focused on the open science community. She will introduce individuals she has met during the HackYourPhD openscience tour, her discoveries, and the questions which were raised concerning the future of open science. Célya will be concluding her documentary in Charlottesville at the Center for Open Science. Clips and footage from her cross country open science tour to date are available at: http://hackyourphd.org/USA. Jeff Spies @jeffspies, Co-Founder of the Center for Open Science @OSFramework, will give an overview of the Center and the Open Science Framework–the Center’s flagship infrastructure for facilitating openness across the research lifecycle. Jeff recently earned his Ph.D. from the University of Virginia and is now focusing his efforts on directing COS-sponsored technologies as well as forging relationships within the open-source/open-science communities and conducting meta-science research. Additional information regarding the Center for Open Science and the Open Science Framework can be viewed in this video. The last hour of the event will conclude with questions and discussion about how open science advocates can collaborate and connect with the open science community.